It seems the site has survived the unexpected rush of hits, so now it's time to return to the reason why I have this site: food and cooking. I made my grilled pork chops a few days ago. Done correctly, pork chops can be juicy, fragrant and delicious. The recipe begins the night before with a rub, refrigeration, and finally grilling. First, we'll need to start with the spice rub. You'll have your preference, but here's the one I created. I use 2 parts paprika, 2 parts chili powder, 1 part light brown sugar, 1 part salt, 1 part ground black pepper, 1 part crushed red pepper, and 1 part cumin. The rub can be made in any quantity and stored for use later. For a small amount use a teaspoon, for a large quality use a 1/4 cup (or more) per part. 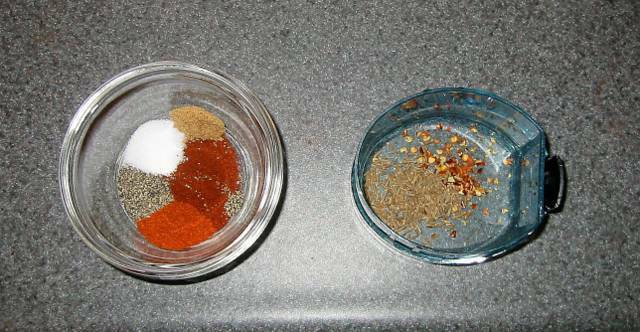 Now, I grind the cumin and red pepper in a spice grinder until powdery. Pour the spices together into an available spice jar. I had just finished a container of dried rosemary, so I used it after washing (and drying!). A salt shaker would work just as well. Laying out the pork chops, I liberally sprinkled the surface with the rub. Then I took one to two teaspoons of dried thyme and sprinkled it over. Using my tongs, I pressed the rub and thyme into the chops before flipping and repeating the rub and thyme sprinkling. The pork chops should refrigerate for about 8 hours before grilling to help the flavors really get into the meat. If in a hurry, I recommend at least an hour of refrigeration. Build a two level fire if using charcoal and grill the chops over high heat for three minutes on each side (or until browned). Move to lower heat and cook until an instant read thermometer registers 145°F (63°C) [336 K]. Let stand for five minutes and serve! Please note that trichinella larvae (the cause of trichinosis or trichinellosis) can survive in temperatures up to 170°F (78°C) [350K], but this usually produces a tough piece of pork. You can avoid danger of trichinosis by freezing the pork at 5°F (-15°C) [258 K] for 20 days. This will effectively kill any trichinella larvae. that's a nice recipe... i tried it before! at -23.30 C (-100 F). The U.S.
along with a margin of safety." can you please cut down on the meat dishes and tell me how to cook vegetarian dishes. that would be great. . I've found most pork chops rather dry-- a result of pork farmers mania for low fat products. Have you tried brining the chops? I use 1/2 cup of kosher salt and 1/2 cup of sugar, dissolved in a gallon of water. Then I soak the chops for 12 hours, rinse and dry them, then apply the rub. The chops are noticably moister. Krikey! Here I was thinking the odds of getting trichinosis were insignificant these days, cooking my pork "just right", and relishing every bite! While I was in blogger I stumbled upon your site! Just what I needed! Thank you so much for this recipe site! It makes cooking seem sooo much easier! "Is trichinellosis common in the United States? Infection was once very common and usually caused by ingestion of undercooked pork. However, infection is now relatively rare. During 1997-2001, an average of 12 cases per year were reported. The number of cases has decreased because of legislation prohibiting the feeding of raw-meat garbage to hogs, commercial and home freezing of pork, and the public awareness of the danger of eating raw or undercooked pork products. Cases are less commonly associated with pork products and more often associated with eating raw or undercooked wild game meats." wow.. I think it's a great way to encode recipes! Cooking pork until it is 160F is unnecessary. Wild game meat is the main source of infection these days, and only a few instances per year. You are more likely to get sick from your meat being than infected (thousands of times more likely). Juicy, rare(r) pork is not bad for you in these fancy dancy modern times. Also, check out Alton Browns statements about this on /. I would not really recommend letting a dry rub sit for 8 hours. Dry rubs contain a significant amount of salt and for that long of a period of time, it will pull out a significant amount of water. This sometimes is a desired effect (as in aging beef) but since pork is so famously dry I'd imagine this isn't what you're going for. If you're investing 8 hours, I'd go with a brine. You'll infuse quite a bit of moisture into the pork chop. You're rubs kind of more complicated than it needs to be. Chili powder already contains a fair amount of paprika. I'd cut out the paprika and just increase the amount of chili powder. I'd be very wary of exposing crushed red pepper flakes to that high of a heat too. You're probably going to burn them. This is all being picky though (engineers are supposed to go for perfect though right :-)). This recipe also works well for any sort of high, dry heat cooking method. You could interchange either broiling or pan-frying here. You could also combind if you're dealing with a thick pork chop. Just sear the outsides in a wicked hot cast iron pan, then pop the pan in the oven at about 350 and cook to temperature. I find cast-iron searing produces a better crust than grilling. In the 10 minute cooking time, I'd wager grilling won't infuse any real additional flavors either. If you're buying quality meat (pork that is) you don't have worry. If you're buying grocery store slag pork then you have more problems than we can deal with. I've got 26 years of eating good food (pork) and have YET to get sick from it. Lighten up people, this isn't 1956. Dry Pork Chops? Start with a cold pan and bring it up from there. However, most dry pork chops come from having the chop sliced too thin (less expensive for the consumer). You'll need something at least 3/4" or 1" for it to come out nicely. Or wrap a piece of applewood smoked bacon around the sucker, that'll infuse some nice flavors. In any case I will usually lay down a piece of bacon on top to give it some pop. Pork always goes good with pork. Or beef. Yes, brining pork chops RULE. But you'd have to be thinking ahead. And most of us Americans don't. Think ahead. 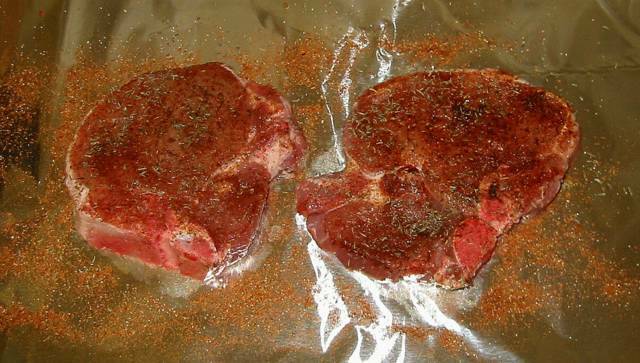 NO, marinating meat in salt doesn't dry anything out. Sorry. I use Rock Salt from some little place in Italy, cover my chickens for up to 2 to 3 days. NO problem. Check out the Zuni. Best tip for juicy pork chops? 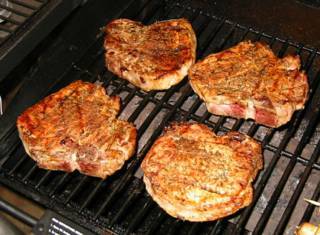 Buy thick cut pork chops instead of the usual �" thick ones. 1" thick is a whole lot easier to cook. I cook them at about 450�F and flip them when they look right. Used to need a thermometer, but now I can just tell. Please excuse the lack of precision: I'm just an industrial engineer. Enjoyed the site! Not sure how I ended up here...but I learned a little and had a few laughs besides. You guys are great! Subject: is a spice grinder really necessary? Since the ingredients in your rub are already ground, and since the rub is going to sit on the pork chops for 8 hours or more anyway, it seems unnecessary to me to go to the trouble of grinding in a spice grinder. I would think the flavors would be infused nicely into the meat in 8 hours from the spices in their already-ground state straight out of the bottles, with further grinding superfluous. Any thoughts or experience in this regard? Thanks. 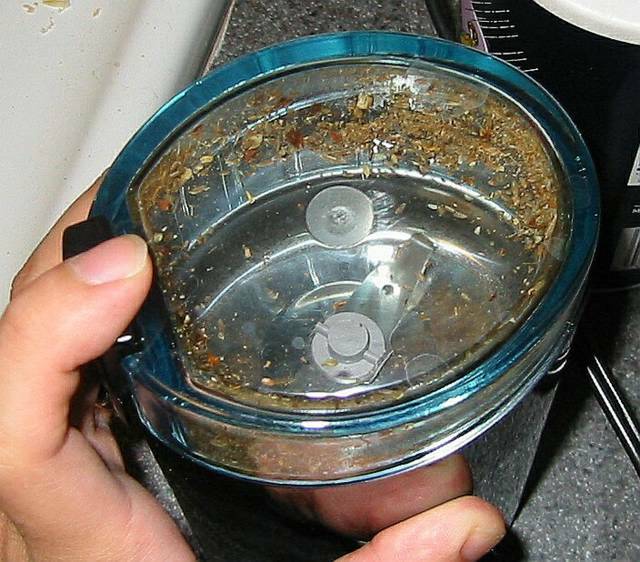 Subject: Re: is a spice grinder really necessary? Since the ingredients in your rub are already ground, and since the rub is going to sit on the pork chops for 8 hours or more anyway, it seems unnecessary to me to go to the trouble of grinding in a spice grinder. I grind the cumin and red pepper because they come in larger "chunks" than the other spices. I grind them to reduce their particle size so you won't get a bite of solid cumin (which has an impressively strong taste). Using cumin powder will solve this problem, or if you like the pieces of cumin, then you won't need to grind at all. I've used this one twice, the second time with a couple of variations. I got great results both ways, but this original way was a little better. The second time I didn't have enough "heads-up" time, so I used some store-bought McCormick Pork Rub I had used before on Memphis-Style ribs. I also used the little trick of putting on a light coating of olive oil before applying the rub. It helps the rub stick to the meat, makes the meat a little less prone to stick to the grill, and helps it brown up nicely. If you need to save some time, these tricks worked out for me. Otherwise the times and temps presented were dead-on. Good job! How does one go about getting a 'real' pork chop, as opposed to the sliced pork loin they call 'pork chops' in the butcher section these days. My Dad, in his butchering days, sliced between the ribs - and only 'chopped' the 'T' at the top. Now, it seems, they just set the saw at 3/4" or whatever and cut the rib into fragments. and brine for at least 12 hours. one gallon of water. Yes, Orange juice at least one Orange. that are under cooked. Besides, no one lives forever. Great recipe! I have to admit I was a bit skeptical that all those ingredients for the rub were going to produce a tasty chop (I'm a ME not a chemmie) but once I pulled them off the grill - all my family and I were doing was licking our chops! I didn't have time to let the spices sit and infuse. I made my rub (cutting down that amount of salt by 25% or more) and put the chops on the grill. This was my very first time cooking pork on a grill. I got caught up doing other things and forgot to check on and turn my meat and time and I burnt one side of some of the chops. Surprisingly, it was still really tasty. My family said I need to grill pork this way more often--they really enjoyed the meal. My daughter, an Electrical/Computer Engineer and her boyfriend (ME) were over and he grilled out for us. I enjoyed the grilled pork so much, I wanted to make some myself. While Googling, I found this website and laughed out loud. I'll try this recipe and will be back for more of them. Thanks for a good laugh and good food. That's more or less what I've been trying but I didn't always get the proportions the same so different results. Good to see the proportions written down. I will try again. (My excuse for bad cooking is always "I'm not a cook, I'm an engineer". I was using these herbs, more or less, mixed with yogurt and left to marinate. Never knew if I was doing right or wrong. Is there any benefit to marinating, say over night? dairy - yogurt and buttermilk for example - are relatively mild on the acidity marinate scale. a lot of how moist the pork will be, after cooking, depends on the state of 'lean' - essentially any really lean meat - poultry to pork - tends to dry out an become hard/tough - overcooking does not help that problem. in the thread you'll find thoughts about brining pork - the aim is to get some water aka moisture back into the meat before cooking. depending on your source of pork and how fat/lean it is, you might want to experiment with that. the other factor mentioned - 'thickness' - should not be dismissed out of hand. a thin pork chop is much more likely to become hard&dry than a thicker one - basically because it can 'overcook' faster/easier. the 'margin of error' in cooking a 1/2 inch thick chop to tender and juicy vs. dry as cardboard is probably less than 2 minutes. a 1-1/2 inch chop more than double that. "sticking it in the oven and setting the timer" could be a major failure point on thin stuff. >and cook until an instant read thermometer registers 145�F (63�C) [336 K]. 336 K ???? You really ARE! an engineer! - "have you seen Dilbert this morning yet?" - "can I borrow $5?"